We have just completed a look at the events surrounding Abu Ghraib, a look that revealed disturbing facts. I've spent 41 years wearing a uniform -- four of them cadet gray, 37-plus years Army green. I was taught during that entire time, and led by example, to live by standards -- duty, honor, country, the code of conduct, Army values, a soldier's creed. Over the years I've been led and inspired by young soldiers -- Specialist Patrick Miller, whom we named a conference room over at my headquarters for his courageous actions, where he was eventually captured at An Nasiriyah -- awarded the Silver Star for his actions. I have a speech in my office from General Douglas MacArthur to the corps of cadets -- duty, honor, country, values. These people, from the young soldiers to the senior generals, have led by example of values in what really counts. But today we are here to discuss the failure of a small number of soldiers who served at Abu Ghraib prison. We conducted an investigation that focused on the 205th Military Intelligence Brigade and its chain of command. However, we went where the facts led us. Our final report is complete and has been turned in. In the course of this investigation, we discovered serious misconduct and a loss of moral values. We set out on our course to find the truth, not to whitewash, and also not to convict those people who are not incriminated. We found that the pictures you have seen, as revolting as they are, were not the result of any doctrine, training or policy failures, but violations of the law and misconduct. 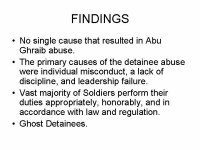 We've learned there were leaders at Abu Ghraib who knew about this conduct, knew better, and did nothing. Some soldiers behaved improperly because they were confused by their experiences and direction. And we found that we violated our own regulations by allowing ghost detainees in our detention facilities. But I have to remind you all of this was happening while thousands of soldiers, sailors, airmen, Marines, civilians, contractors fought bravely to restore freedom in Iraq and Afghanistan. We're very proud of their service, their commitment, their courage and their values. Their families can and should stand tall and be proud about what they do. But we're going to report to you about those who failed. We conducted an investigation called a Procedure 15, which is for intelligence purposes, under an Army regulation which is called a 15- 6. That means that we found -- that all of our findings had to be substantiated with statements that could be legally supported, and so that when we turned in our report, they could be used for the purposes for which they were referred without additional review for legal substantiation. We used the reports of Major General Taguba, Major General Ryder, the Department of the Army IG, to supplement our investigation. Over 9,000 documents were collected, catalogued and archived into a database. We conducted interviews with more than 170 people, with an investigative team that consisted of more than 28 personnel, from analysts, subject matter experts and legal advisors. After those reviews, we again reviewed the findings by an additional team of 12 people, again for legal sufficiency. The investigative teams traveled to Iraq eight times, to including the three of us, who just completed a trip to Iraq and to Abu Ghraib, a trip in which we turned over our report to General Abizaid, the commander of all our forces in Southwest Asia, and General Casey, the commander of the forces in Iraq. Major General Fay was initially appointed by Lieutenant General Sanchez, who later recused himself so that the report could account for all of his chain of command to include himself. I was named as the appointing official, as a result of that, in June, and Lieutenant General Jones was named as the senior investigating officer. I'd like to now spend five minutes to review with you the context in our significant findings. 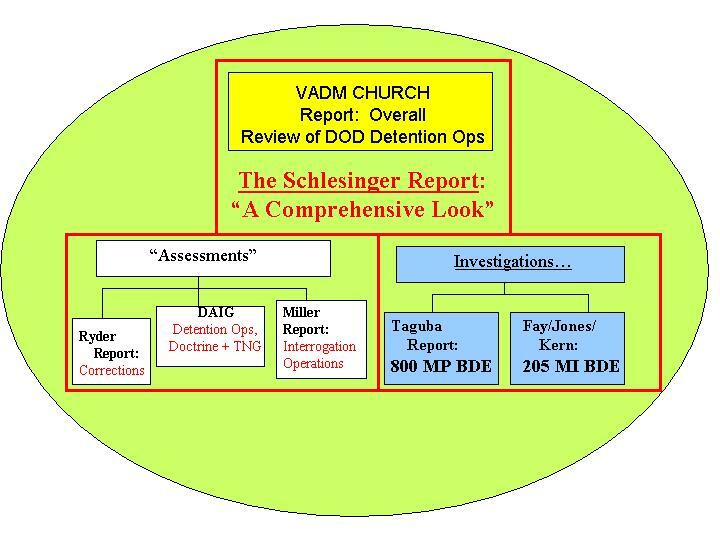 First, in the hierarchy of reports, and most of you were here to listen to the Schlesinger report as a comprehensive look yesterday, we still have Admiral Church's report to be completed -- we expect by the 20th of this month -- which will fill the gaps and seams; the assessments I referred to earlier as Ryder, the DAIG -- Department of the Army IG -- and the Miller reports; and investigations, legally substantiated reports which were done by Major General Taguba and Major General Fay and Jones. General Taguba focused on the 800th Military Police Brigade; ours reported on the 205th Military Intelligence Brigade. There are overlaps. 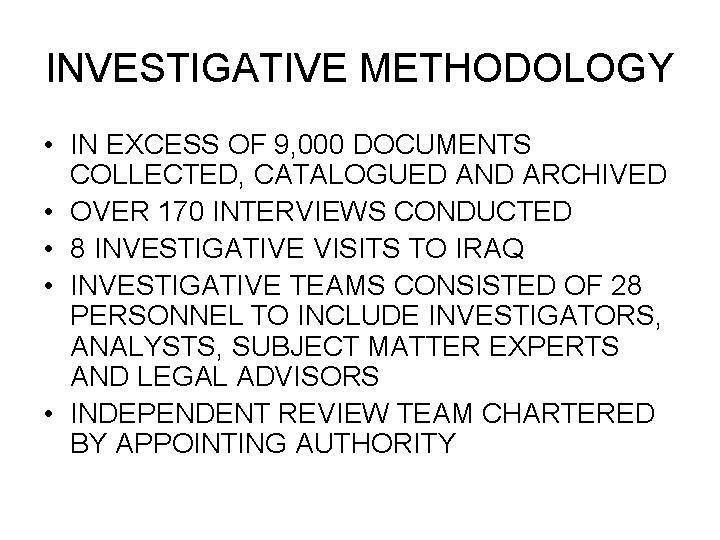 This is a summary of the methodology, which I described to you, which includes all of the investigations and reports. The independent review team, which I chartered, had taken one more last look at this report to ensure before we submitted it that we had done a thorough job. 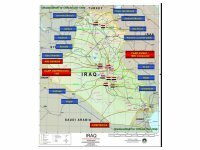 This particular chart is a map of Iraq, which I think most of you are familiar with. But what we tried to lay out here, in a country the size of the state of Texas, we had a number of detention facilities. 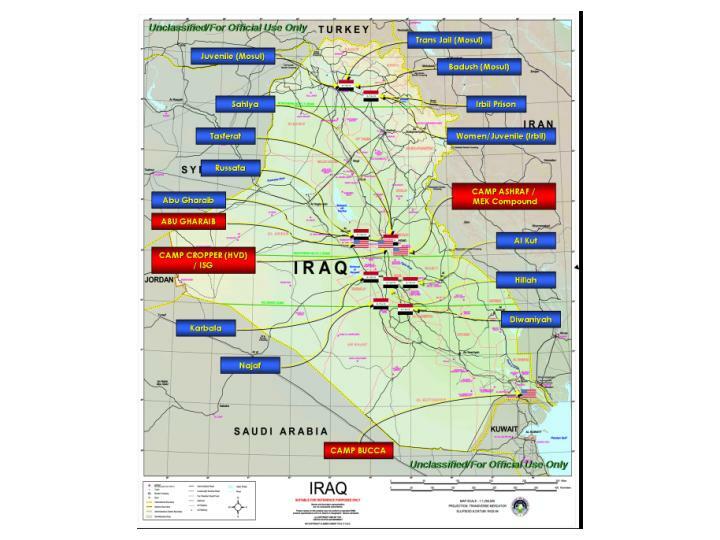 Those which are shown in blue -- which were detention facilities which the Iraqis have established, but the 800th MP Brigade was co- located with them as part of the surveillance and security of those systems. Those in red are the particular U.S. detention facilities. 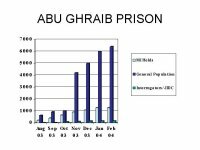 And we focused on Abu Ghraib, which you note is both in blue and red because there were civilians there from Iraqi criminal courts who were put in that prison as well as the detainees brought there by U.S. forces. And so we have both at Abu Ghraib, which lies on the outskirts of Baghdad. This chart lays out the number of detainees that we found over the period of the investigation, from July of '03 to February of this year. This period is a period of transition, where Lieutenant General Sanchez, after having commanded the 1st Armored Division in April and May, is promoted to lieutenant general and is given command of the Combined Joint Task Force Number 7, CJTF-7. During that transition period, in which this number of detainees is increasing, he was given a mission of establishing stability and support, support to Ambassador Bremer's organization, the Coalition Provisional Authority; and there was an expectation that the number of detainees would decline, not increase. In fact what we found was during this transition period, they increased. 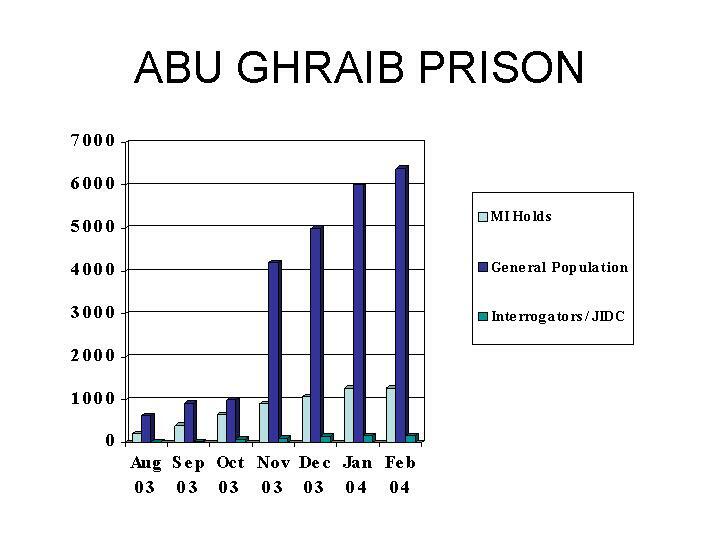 The light blue shows the total; the dark blue shows the increases specifically at Abu Ghraib. I could focus now a little bit more on Abu Ghraib. 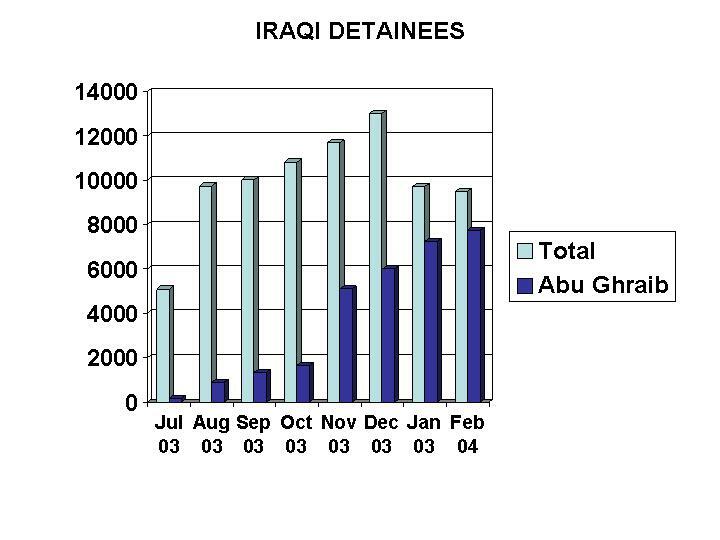 That same number shown here again in dark blue of the detainees, somewhere around 600 in the early summer period, to over 6,000 by February of this year. The light blue refers to the military intelligence holds, those detainees which we thought had specific intelligence values which warranted further investigation. 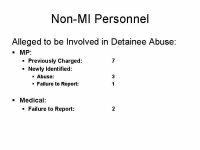 But between those two bars it was not clear when those detainees were brought in, which category they originally fit into, and so interrogations went beyond just the military intelligence holds to a large part of that general population as well. The green shows the number of interrogators, starting at approximately 14 interrogators in the summer time period, to a number today which is about 160. What I don't show on here is the total number of military police who were also there, which was the subject of General Taguba's report, but proportionally you will find that they do not increase with the same increase in the number of detainees. The challenge, therefore, was a mismatch between the number of detainees, the number of people to secure the facilities and the number of people to conduct interrogations. This is an overhead photograph of Abu Ghraib, located on the outskirts of Baghdad. It was a facility, which has a rather sordid history under Saddam Hussein. I think most of you know that. It was a facility, which could hold up to about 12,000 people as it was designed, but much of it had been destroyed, both by the war and by looting which took place afterwards. 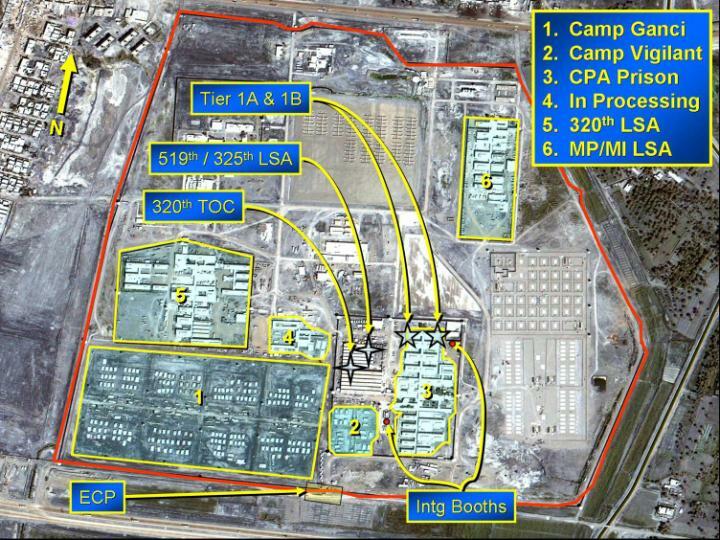 And so, many of the detainees were kept in a tent structure, but the particular part that has all of the attention is Tier 1-A and 1-B, the hard sites or concrete fixed facilities in which interrogations took place and the high-value detainees were kept. And so you have a large facility down to a small facility. It's important also to note the tents were relatively open, particularly during the hot weather, so you could see what was going on there, and initial interrogations took place in these open facilities. But where the majority of our abuses were found were within a closed facility which the general population could not see what was going on, and again a contributing factor to the abuses that occurred. You're all into numbers and trying to categorize this, so we've done our very best to make these numbers relative to information, which you have heard. With respect to the 205th Military Intelligence Brigade -- so these are military intelligence personnel -- we found that 23 could be associated with abuses and four contractors who were working as military intelligence interrogators, for a total of 27. We found in addition that there were 6 military intelligence personnel who saw what was going on but failed to report it, and in that category we also found two contractors. Twenty-seven and eight, abuse, failure to report. The contractors were there because they were brought in to supplement the military intelligence uniformed personnel to keep the numbers relative to the number of detainees. For non-military intelligence personnel, we break them down into two categories. Military police, previously charged -- the ones that you've been hearing about today -- seven. But we identified in addition to that three more for abuse and one for failure to report. That's in the military police category. In the medical category, medics, we found two who witnessed abuses but failed to report it. Those are the number of people that we found associated with the category of abuse. There are 44 total instances. Some of the people may have been involved in more than one instance of abuse that we have in our report. We found first that there was no single cause. There were contributing factors and the direct result, however, were individual misconduct, a lack of discipline and a lack of leadership. Cause, but no single cause. You have to contrast that with the few thousand soldiers, both military police, military intelligence and supplemented by contractors, that were in the facility who were doing their job right. And so the vast majority did perform their duties appropriately, honorably, and in accordance with law and regulation. And then, finally, we also found and documented the cases of eight "ghost detainees," people who were brought to the facilities but were not recorded. Now were there more? We don't know because what we found is, without records, it's difficult to document. In all these cases that we have found, we have referred them to the appropriate level of command for further action. It is not our job to determine what that action is. In the case of the military, it could be either administrative or the Uniform Code of Military Justice. The contractors become referred to the Department of Justice since they do not fall under the Uniform Code of Military Justice. And finally, in the case of the "ghost detainees," we've asked the Department of Defense inspector general to investigate that as well as the agency's inspector general. So those are the summary of the findings and the results that we found. This was a period of transitions and great turmoil in the theater. General Sanchez was faced with what he thought was going to be a stability-and-support operation, which resulted in continuous attacks in increasing numbers throughout the entire period. He was faced with having to develop intelligence so that he could determine why the attacks were occurring, where they were going to occur next and what he could do about it. He put a lot of pressure on his people to get that intelligence so that he could take appropriate actions, and that's one of the challenges that we found. We should also note that today more than 900 servicemen have given their lives to establish a better life in Iraq for the Iraqi citizens, and more than 200,000 have toiled in the heat, the wind and the attacks, and separations from their families. The events that we just reported to you and that are in our report are in stark contrast to the rest of those personnel, and I ask you to please keep that in mind. And then, finally, with all of those reports, with all of those investigations that we looked at, with those more than 170 interviews, we obviously had a lot of people cooperate and help to put this report together for General Fay and for General Jones, and we'd like to thank them for that cooperation. This was a rather exhaustive report, and we find that the cooperation that the people who did give us helped us do our job in finding truth and putting the facts in line with what we now need to know to do to conduct the actions to fix the problems. With that, I'd like to finish my remarks. And General Jones is the senior investigator. General Fay is the original investigator. And I will have to tell you that General Fay and his staff of 28 made numerous trips into and out of the theater and conducted many, many months of very thorough investigations, and has done a tremendous job in providing and shedding real light on what happened. Q General Kern, I'd like to ask -- you're not naming these people, I take it, these 44. You aren't releasing any names? Q Forty-four instances. Are you releasing any names there, or are you waiting until charges might be preferred, or are charges in the process of being drawn up against these people? GEN. KERN: All of the above. So we do not want to use names until charges have been preferred so that we keep the cases clean. Q Could you at least tell us whether Colonel Pappas, being the commander of the 205th, is among those who were referred for possible charges or possible discipline? GEN. KERN: Yes, we believe that the commander is one of the people involved. Q And just one question -- I'm sorry -- for General Jones. Do any failings by the general in charge at the time in Iraq, do they rise to the possible level of criminal negligence? GEN. KERN: We did not find that, but I'll let General Jones, who did that, answer your question. GEN. JONES: As you know, I was charged with looking at the chain of command above the 205th Brigade. And as General Kern has said, putting things in context, what they were faced with as they transitioned from 5th Corps -- and the commander -- faced with a counterinsurgency -- fighting that while transitioning numerous people. In my 34 years -- I started a little bit later in life in the military than General Kern, so I only have 34-plus years -- I can sympathize with what they were going through, the complexity of the environment, what it's like to fight a war. As I look at it, I had to determine three things. In the chain of command of the 205th, were they directly or indirectly involved in the execution of the mission they had given their subordinate units? Did they provide clear and consistent guidance to those units and to those leaders? And did they resource them appropriately? Given the responsibilities in our profession of the commanders at all levels being responsible for the leadership below them and the units below them, my conclusion was two things: one, that the leadership above the 205th MI Brigade were not directly responsible for the violent abuses that happened as we've depicted. However, I will tell you they bear responsibility for those things that happened in the units and the soldiers underneath them happened. But neither did their policies, procedures, nor doctrine, nor training also cause or condone the actions that were taken, specifically the violent abuses and the sexual misconduct. GEN. KERN: Let me clarify. Remember General Karpinski is the commander of the 800th Military Police Brigade. Q But she was in the chain of command. GEN. KERN: She was -- we would like to say that, but not explicitly. And that was one of the confusion factors that we did find and report on. What we found was that -- and General Jones reports on it very clearly, and I'll let him add to that -- is there should have been clear direction given from General Sanchez and his deputy to ensure that General Karpinski knew what her role was. Q But as far as any charges are concerned, potential charges? GEN. KERN: Again, we are not referring charges that are outside the boundaries of that, and some of those already are in the report that General Taguba has submitted on the 800th MP Brigade, which did include General Karpinski. I'm not trying to duck your answer, but it could be referred to outside of our report. Q General Jones has made pretty clear that he doesn't think that your top general should in any way face charges, given the circumstances. GEN. JONES: We've provided our report and all the things in our report to include the mitigating circumstances of what this unit -- what the headquarters, with General Sanchez, and what they were going through, to include: continue to prosecute the war; the counterinsurgency; support the Coalition Provisional Authority; support the Iraqi people in the reconstruction efforts of their country and the establishment of the directorates which they needed to establish, working with different agencies and entities to do that; and what that caused them somewhat, based on their under-resourcing and movement to that transition to a combined joint task force; all that was going on at the same time. They completely changed the leadership in their staff, moving from tactical level to operational and strategic level. They had to change the mind-set at the same time they had to fight for intelligence, establish an intelligence operational structure which enabled them to fight that counterinsurgency, determining who this faceless enemy was, what the support base was, and so forth. And that morphed over a period of four to five months in which they worked 24/7 just to get that accomplished. GEN. KERN: I think to very specifically answer, we did not find General Sanchez culpable but we found him responsible for the things that did or did not happen. Q Could I ask Major General Fay a question? Yesterday we heard in the Schlesinger report that those pictures, the now infamous photos, essentially were not taken to get intelligence targets, value, from those people in those pictures. Of the 44 abuses, what percentage would you say were during interrogations or as a part of the interrogation process? GEN. FAY: First I would suggest that each one of the 44 incidents that we go through in our report is a story unto itself, so each one should be read individually. Most of the abuses that everybody is so familiar with regarding the pictures -- those horrendous pictures -- they relate the things that had nothing whatsoever to do with interrogation practices or military intelligence involvement. There were a few pictures that had military intelligence soldiers shown in them, and we do find instances where some military intelligence soldiers participated in the actual abuse. The actual number is we actually found three military intelligence soldiers that were in the pictures, and two of those three participated in the abuse. One failed to report the abuse. Additionally there was one contractor shown in the picture who participated and failed to report the abuse. Q And on the ghost detainee issue, did you find a motive for the ghost detainees? Were they at some point directed to not put them in the record to avoid the ICRC? 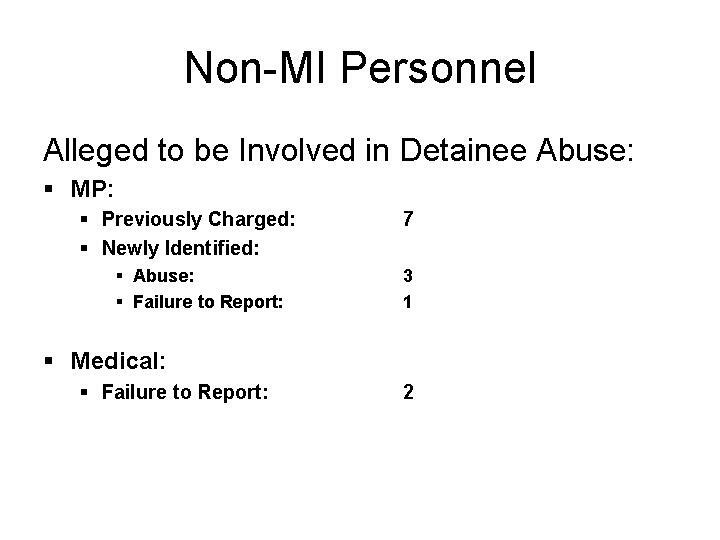 GEN. KERN: The ghost detainees clearly were there in some number and they clearly were not recorded as required by the International Commission (sic) of the Red Cross. So to answer that question, yes. Now we can't tell you why and we can't tell you what was motivating all of that. We could -- and so we have in our report directed that the Department of Defense inspector general and the agency inspector general further investigate to specifically answer your questions. Q General Kern, can you turn to a second -- for a second to CACI, the major contractor? 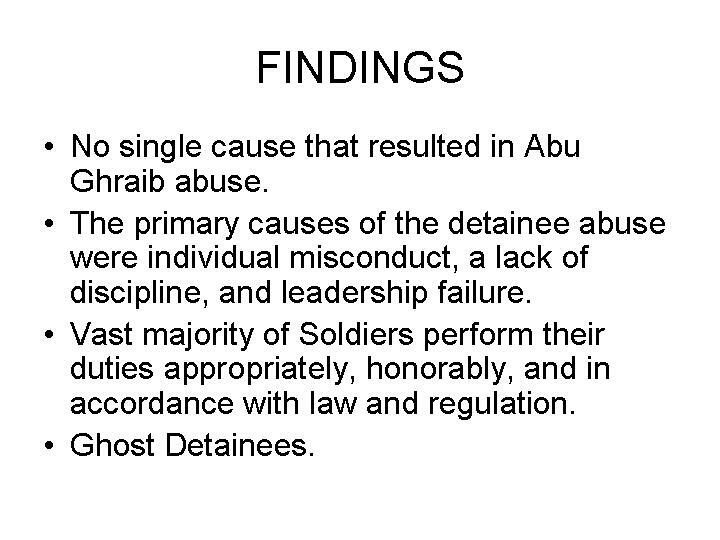 Steven Stefanowicz was mentioned in the Taguba report as one of four individuals that General Taguba suspected was directly responsible for the abuses at Abu Ghraib. Can you -- did you back that up, and is he one of the contractors who's been referred for potential action? GEN. KERN: We clearly did, as we suggested, use General Taguba's report to find it, and General Fay continued that investigation, and that is what is reported. And George may want to just add a little bit of clarity to that. GEN. FAY: As you know, we're not going to, today, deal with specific names, but the names are obviously covered within our report and they're part of our report. But we did substantiate that there were contractor involvement. Q Well, wait a minute. His name has been hung out to dry now for seven months. Did you verify what Taguba said or not, in terms of him being one of those who were responsible? GEN. FAY: In some instances we verified what General Taguba said; in some instances we were able to exonerate at least one of the individuals named in General Taguba's report. And we'll leave that for when the Army decides that they're going to actually release the names. Q Can you detail some of the abuse that wasn't seen in the photographs? General Fay said each one was a story within itself. What kind of abuses were you seeing that we don't know about from the photographs? And also if you could detail or give us any more detail about Colonel Pappas and what kind of charges you think he might face. Was he encouraging this? Was it a failure of leadership? GEN. KERN: Let me take your first question and give you one or two examples. And then on your second question, we refer what we find to commanders for action. We do not make a judgment on what that action should be. Q But if you could talk about some of the findings. GEN. KERN: The findings, what we have are listed there, and they fall into the category of the leadership and what he failed to do. Now let me just give you two examples of abuses. There's cases that we found of where people were put into isolation. By itself, not an issue if done properly. When a person is isolated, without any light, in the conditions of the temperature extremes -- in the summer very hot and in the winter very cold, and the person is naked -- that is an abuse. And we found instances of that. I think the most horrific one that we found, from my perspective, is the case of where MP dog handlers were subjecting two adolescents to terror from the dogs for the purpose of playing a game between the two dog teams to see how poorly they could get these kids to behave, and that's specifically to see if the could get their bowel movements and their urination to work. I asked General Fay if he'd please add any other facts that he wants. GEN. FAY: The abuses we found -- we had a very stringent definition of abuse, because no abuse is tolerated by us in the Army. So we wanted to identify each and every instance. Each one of those are contained within those 44 incidents that we already discussed. And they range from what you might consider minor abuses -- such as unlawful stress positions, where people were placed in positions that were unauthorized, discomforting, but certainly not of the range of the abuse that everybody is familiar with relative to the pictures -- so they range from the relatively minor abuses to the very significant abuses that everybody's familiar with in the pictures. Q Sir, could you -- unfortunately we're here without benefit of the report because the Army declined to release it to us beforehand. So forgive us for having to ask such detailed questions, but we don't have the details. 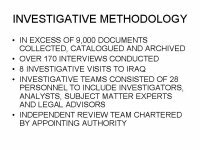 Could you outline -- in the executive summary that we were given, it talks about how most of these occurred outside the scope of interrogations, but that means some of them did occur within interrogations. Could you describe those situations? And there's also a reference here that most of this was misconduct, but some of it was misguidance from confusing rules that came down for how detainees should be treated. So could you talk about that smaller subset that was a result of -- that occurred during interrogation and as a result of confusion over the guidance as to how to handle the detainees? GEN. KERN: In the first case, an example. A detainee was interrogated naked. They thought, unfortunately, that -- the person who had submitted that request to do it that way, that it was okay. It clearly was not, and that is one where we find that he violated the concept of humility. In cases of where it was a lack of clarity, as I showed you in the earlier chart, you had this escalating number of detainees and interrogations which are taking place during that entire period. The people who were conducting the interrogations clearly were feeling a lot of pressure to produce intelligence, as they should have been. That's what the purpose of the interrogation is. And in looking for that guidance, they were submitting requests back and forth, which were never in our view completely clarified. So they were using drafts of other processes that they had known and they were asking for clarity, which in the end resulted in a couple of memos which were published by the Combined Joint Task Force for them to use. But in the end, it did not absolutely make it clear what the boundaries were. And I'd ask both General Fay and General Jones, who looked at both of those issues more clearly, to comment. GEN. JONES: Basically, when you get at the promulgation of different policies which have now gone to different theaters -- and we had interrogators who had been stationed at Guantanamo, interrogators who had been stationed at Afghanistan. They'd also served with different units and different entities which use different techniques over and above what's doctrinally and what they'd been trained on. That led them to an understanding that -- what may or may not work void of any guidance -- guidance on what techniques to use or the limits to their authority. Subsequent to that, in September and October there was two policy memos put out by the commander of Joint Task Force-7 -- one in September, later rescinded, and then came out again in October. Those two policies also led to some interpretation at the tactical level based on the safeguards, because in the second one the safeguards said, "if using dogs in interrogation, they must be muzzled," although that wasn't an authorized procedure. So that's the fine point. I will tell you that the one thing that's consistent in doctrine and in the policies has to do with the emphasis on humane treatment of detainees, and that was also reenforced in October and December memos out of the CJTF-7. And had people followed basic doctrine and the rules of law and the Geneva Convention, the violent abuses would not have happened. GEN. FAY: If I could just finish on that one part of the question. I think it's important to note that we did find that there was some collusion in the interrogation process in some -- a few instances where military intelligence personnel and military police personnel colluded to conduct unauthorized interrogations and inappropriate interrogations. And one example I would give you was an instance where a contract interrogator was interrogating a detainee and threatening that detainee with turning that person over to a known military police person that was conducting some physical abuse on that particular detainee. In other words, "Answer my questions or I'll turn you back over to the military police person." So there was some instances during an interrogation where there was collusion. Those were very limited in numbers -- they're covered in detail in our report -- but they are there. Q Could I ask you about the issue of whether or not the -- some of the military police have said that they were ordered by the military intelligence to "soften up" the prisoners. I think that relates to General Fay's comments. Did you find that, that military intelligence had directed military police to "soften up" prisoners? GEN. KERN: General Fay just gave you an example of one. We found a very few like that, not many, but we did find a few. The general allegation that that was a process being used we found to be not true. Q And also, just a follow-up. Yesterday Mr. Schlesinger talked about this whole affair having a chilling effect on the ability to conduct interrogations and get intelligence. Can you comment on that? Was that your observation as well? GEN. KERN: I think that's an area that we worry about. And General Schoomaker has also reiterated that point in his testimony, that the purpose of interrogations is to produce intelligence. And we produce intelligence so that we can take action to prevent further insurgent actions, attacks on Iraqi citizens or other pieces of the operation so we really can get to stability and support. But what we found in the process from my perspective is that's a concern that we should all ensure that does not happen. Look, we just returned from Abu Ghraib, where we met a young PFC, young soldier, female, conducting interrogations, and she was absolutely on point, doing it right. Now what we really believe is happening and should come out of this is that soldiers are doing it the right way, by law, without abusing detainees, and still producing intelligence. 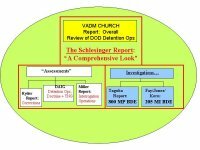 There is still that concern that both General Schoomaker and Secretary Schlesinger put out there that we do worry about. Q General Kern, you've mentioned a couple of times you referred the eight ghost detainee cases to the IG here in this building, but also to another government agency IG. Specifically, what agency is that? And can you also tell us what cooperation or information, if any, you solicited from the CIA, and did you get any cooperation from them? GEN. KERN: The answer is, on the eight, those are the ones that we could document. Whether there's more or not and who from other government agencies in the total picture brought them in there we can't be explicit. And that's why we asked the Department of Defense inspector general to do that with the other agencies. Q What agency is that, sir? GEN. KERN: Other. There's more than one that potentially is involved. We can't tell. Now we will tell you that we are in our report -- the other agency that we've asked to investigate, it is the Central Intelligence Agency. GEN. KERN: But I can't tell you they're the only ones. Q Okay, but you have asked the CIA. Can you tell us anything you might have learned in your report -- again, we have not seen the report -- about the CIA involvement with the ghost detainees -- there must be some reason you've asked them to look into it -- and what cooperation or information you may have solicited from them and what you've got from them? GEN. KERN: I think the answer is clearly that they will investigate it. They have talked to us about that. They understand that they're going to do that. They have also had the assistance of General Fast going back to them before any of our reports are put out, said that you will abide by our procedures, and they agreed that they would do that. So again, an area of cooperation. They have agreed in helping us with building the fusion of intelligence activities, which is critical to the entire operation, and so that comes from multiple organizations. And so when we say other government agencies, we really truly do mean multiple agencies have to be part of that intelligence fusion process. I will tell you that the cooperation today with them, I think, is going to get us to the answers that you're looking for. I cannot give them to you explicitly today. And George, you may want to add some to that because you've been involved in it more than I.
GEN. FAY: Yes. I had some specific conversations with the CIA about the issues that we wanted to explore in our investigation, the people we wanted to talk to, the documents we wanted. And they made it very clear to me that they're going to conduct their own thorough, detailed investigation, and that in fact the results of those were still pending. GEN. KERN: In the middle. Q General Kern, you talk about in the report, I believe, that the interrogation practices of the CIA led to a loss of accountability and also abuse. I know you said you're going to refer this on, but what did you find that led you to conclude that, even in that preliminary way, in your report? GEN. KERN: We found, as suggested in the eight people, that we knew there were at least eight people who were brought there by other agencies, that were not recorded, not asked to be -- specifically asked not to be recorded. That's in violation of our process and procedures. GEN. KERN: We believe, and it needs to be further investigated because we cannot substantiate all the information we had on it right now because of the lack of things not being recorded -- that they were conducting -- other agencies were conducting investigations in our facilities without having gotten all the approvals that should have been done prior to that. George, do you want to -- or Tony? GEN. JONES: Yes. Back at your basic question, the focus generally was on detention and compliance with detention, which means when a person is detained or incarcerated, they get medical screening, they are documented why they are there, and they are accounted for on the rolls. That is the piece that got our attention initially. Q (Off mike) -- you have reason to believe that that happened. GEN. JONES: We have peripheral evidence of that happening . We've asked them to get back to us and tell us what they were doing. GEN. FAY: The numbers get very confusing very quickly. So if we could just have the numbers in front of us. 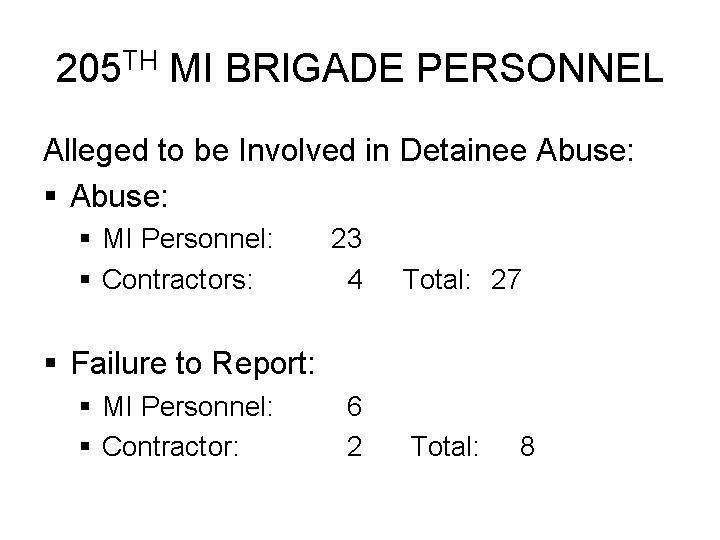 Q (Off mike) -- contractors, whereas the executive summary talks about specifically MI personnel. Just to be clear. GEN. KERN: Twenty-three and six is 29. Q Can we just follow on that for just a second? 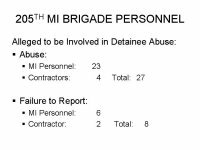 If I did the math correctly, you're talking about 40 people all told between the MPs, the MI folks, I guess the contractors, the medics who didn't report these things. Is that the scope of that, or did you not mention or do you not take into consideration the folks under B, Abusive Actions Taken Based on Misinterpretations or Confusion Regarding (All Our Policy ?). GEN. KERN: I hate to get into these numbers to try and resolve them, because there's instances and there's people and there's different categories of them. I'll let George try to get that as best as we can to clarify it for you, and then we may just need to follow up on it and make sure that we are all talking all the right -- same numbers. GEN. FAY: As best as we can. Now, the 15 of those 23 personnel, 15 are those that we consider to have been doing things that were abusive but thought that they were doing things appropriately. In other words, they thought they were acting within the scope of their responsibilities and their duties. Q General Kern, if most of the alleged abuses involving military intelligence did not involve photographs, how did they come to light? GEN. KERN: A hundred and seventy interviews. This was an extensive number of interviews and reports. The method that was used is very similar to some of our intelligence collection techniques, where we can database information, cross-reference pieces. We worked with the Criminal Investigation Command, all of their information, all of the Taguba report's investigation; if we couldn't identify people in a picture, we worked to find that out; and then correlated all those reports. And that's the process that was used. GEN. FAY: Yes, sir, that basically covers it. It's just the old investigative techniques that we always use, and it's going out there and talking to a lot of people and then getting a lot of references. And documentation was important to our investigation, which is why we have over 9,000 attachments. Q Excuse me -- General Fay, you all have indicated -- in fact, have said that Colonel Pappas is among those who you've referred to command for possible action. GEN. FAY: He has been referred, but not because of direct involvement. GEN. KERN: Remember, he is a commander. And with a commander he is tasked with the responsibility for his people to conduct things in accordance with the laws and regulations. GEN. KERN: -- the first point that we find that he was a shortcoming. There -- and I think I can be -- being a little bit careful in how I answer this to make sure I don't get outside the boundaries, but there is no direct correlation to those abuses that we're reporting. GEN. KERN: The concern we have is on the failures of leadership through a number of chains of command that took place. Q So there's no indication he actively ordered or condoned the breaking of rules? Q General Kern, general question for you. GEN. KERN: First Bob, then I'll get you. Q Of the 44 instances, did any of them lead to death of detainees? And did any of these instances amount to what you would consider torture? GEN. FAY: The one instance -- one of the 44 involved the death of a detainee and it happened to be, in fact, the ghost detainee that was brought into Abu Ghraib -- brought in and he was conscious at the time that he was brought in, and subsequently died while he was in custody at Abu Ghraib. GEN. FAY: He was -- well, the -- that case is actually still the active subject of a CID -- Criminal Investigation Division -- they're actually actively investigating that case, so it is not a closed case and it wouldn't be appropriate for me to comment at this time as to what the cause of his injuries were. Q Oh, he was the "iceman" case, General? Q And the torture question? Q Did any of it amount to torture in your view? GEN. FAY: Torture is a subjective term, but in my use of the word "torture," I would consider these things to be abusive in nature. Torture sometimes is used to define something in order to get information. There were very few instances where in fact you could say that was torture. It's a harsh word, and in some instances, unfortunately, I think it was appropriate here. There were a few instances when torture was being used. Q Can you give an example to that effect? GEN. KERN: I promised him. Q I wanted to ask you about the statement that Combined Joint Task Force 7 was not resourced adequately. I want to understand. Do you mean they needed more MPs and more MI at Abu Ghraib? Do you mean that they needed more troops generally in the country? Because General Sanchez was very frontal on that point. All during those months you're talking about, whenever he was there, he said, "I have enough troops to fight the war." GEN. KERN: We're talking specific to the detention facility at Abu Ghraib, the resources provided there, not the totality of the operations in Iraq. GEN. KERN: The resources that we're talking about specifically there, as I showed you. There were not enough interrogators, and in our view there were not enough military police in proportion to the number of detainees that were occurring. And the security, you know, which General Sanchez clearly stepped in and took action on his own to improve the security, required additional resources. In addition, there's some physical resources, you know, which we found. Remember when I described the situation early on where detainees were held in open tents and everybody could see what was going on. Try to put in your mind a picture of what happens in a prison. What do you see normally in a prison? Cameras everywhere so people can see what's going on. Cameras are there so that you can both prevent uprisings/revolts from taking place, and they're there to ensure that abuse does not take place. They are being brought into that now. The detention facilities themselves were open tents. It was pretty rough and rugged. There was not a lot of hygiene capability. There was not all the right food. There was not all the right clothing. And so those resources had to be brought in, but they were always lagging behind the number of detainees that were coming in. And so there's a whole range of resources, from people to equipment to food to facilities, that we found were lacking and contributed to the overall environment that was in place there. In the back, if I could. I haven't -- yes, please. Q I'd like to ask a question. GEN. KERN: In the purple shirt. Q Okay. Was Colonel Pappas the most senior officer referred for disciplinary action? And if there was anyone more senior, can you comment who? GEN. KERN: I have to, again, be careful on how we capture this now. But within the 205th MI Brigade, he is the most senior person there is. Q So you didn't look -- you didn't look above that? GEN. KERN: And you heard what General Jones described -- we did look above that. We did look above that, but we would -- we found no one above that grade culpable in the abuses that took place. They contributed to the conditions that were there that allowed some of it. GEN. JONES: No, I would just say they share a -- as we -- I stated earlier, they share the responsibility of what happened by virtue of being in the chain of command of these two units and how much they did or did not do in the direct oversight of the leaders, two new leaders which came in in June, early July of 2003, two new brigade commanders, and then there's subordinate organizations. GEN. KERN: I'll take one more question. GEN. KERN: In the back, in the white shirt. Q Yeah, I'd like to ask about the failure to report cases. There were roughly nine of them. Were these voyeurs, people watching the abuses unfold, or did they happen to look at the digital images? GEN. KERN: These are people who actually saw these cases unfold and did not report them. Q (?) Who saw the photos and did not report them. Q So then on the next question, you did 170 interviews. Are you saying that just a handful of those people actually saw the digital images and failed to report those? GEN. KERN: Well, I mean, the answer as to who saw the digital images at this point is unlimited. GEN. KERN: It's a point in time that we looked at, that the investigation is to. They were fairly widely distributed, and we were determining in this case who actually saw what was going on and failed to report, and those are the ones that we identified. Remember, we're in this particular case and we're categorizing they are -- if they'd already been identified in other reports, we weren't adding to that. And so there are other cases that are not in these numbers as well. GEN. KERN: General Fay, did you want to add one more query to that? Q Is there only one person outside of this chart, Colonel Pappas, or can you just say only one person that's being recommended for any kind of action, any disciplinary action for -- only one person outside of this chart? Can you give us at least a ballpark -- you're not naming names -- on how many? GEN. KERN: Four I think is the right number. GEN. : Four others. There's four others. GEN. KERN: Oh, four others. Q So a total of four or a total of five? When you say four others, do you mean in addition to the one you've already talked about, or just four total? GEN. KERN: Four others. Five total. GEN. KERN: I already said that this is the last question, and I really do have to apologize. We're going to have to move on. If I could please kind of go back to summarize what we've looked at today. This was clearly a deviation from everything that we have taught people on how to behave. There were values that we treasure in the United States Army and in the United States that were not upheld in the report that we have turned in. That in itself is extremely troubling. There were failures of leadership, of people seeing these things and not correcting them; there were failures of discipline -- both, again, hallmarks of what we believe are the values and the creed by which we live in the military. That is very troubling. We are recommending in our report that actions be taken to fix all these things. But I would tell you today, as we have just returned from both Afghanistan and Iraq, that you will not find those conditions there today, that we are doing a very thorough certification process of the people who are involved in detention interrogations. There are people who are very clearly in charge of Abu Ghraib -- Major General Geoff Miller, who has brought organization, discipline and leadership to that prison facility. There are actions being taken in our schools to change doctrine, to improve training today -- not waiting. There are training -- in theater for the people who may have missed the school training to ensure that they are thoroughly prepared. And so the circumstances today, notwithstanding actions still to be taken on our report, are much improved from anything that you've heard reported in any of the previous reports. So you can feel good that people have taken action to fix problems, which I've identified and are not just waiting for official reports to be turned in. That does not in any way account for the fact that wrong has occurred, and I do believe that our justice system, both in the military and our civilian community, will take the appropriate actions to make sure that they're fixed. But I would also like you to remember: There are thousands of soldiers, sailors, airmen, Marines, contractors, civilians -- from the State Department, from many other organizations -- who are working over there under very tough conditions every single day. And they're doing the right thing. They're doing it honorably, and they have families who should be very proud of what they're doing, and you should feel very good about what they're doing. But again, it does not make up for these shortcomings, which we've noted. But we are proud of all those others who serve our country and serve you.